Socialure has teamed up with Adomni to offer DOOH advertising across the Las Vegas Valley. This newly formed partnership makes it possible for anyone, whether a large corporation, mom-and-pop shop, or an individual with something to share, to advertise on Las Vegas’ famed digital billboards. The partnership is looking promising for the duo; in Q4 2017, the companies plan to expand their products to other large cities. 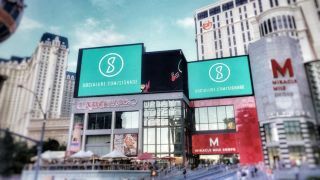 High-profile digital billboard advertisements can now be instantly purchased online on the Sociallure website (www.socialure.com/signage). Locations include McCarran Airport, Las Vegas Blvd, the Sahara, and Planet Hollywood/Miracle Mile. Advertisers are also able to launch campaigns on digital taxi tops and screens inside airport shuttle buses.